Maryam Mousavi asked for information on the many types of SD Cards and how they relate to each other. I’ve seen this happen over and over again: A new, simple-to-use technology arrives, with its own new acronym. Then someone improves upon it, extending the acronym. Then there’s another one. Soon you’ve got a market of confusing alphabet soup. So let’s start with the basics. Secure Digital (SD) is the current standard for removable flash storage cards in mobile devices. They come in three physical sizes with numerous speeds and capacities. A number of seldom-used features justify that S for Secure. One of them, Digital Rights Management (DRM), is for Hollywood’s benefit, not yours. Other, more consumer-friendly features include a write-protect notch (only on the full-sized cards) and password protection on a few select devices. 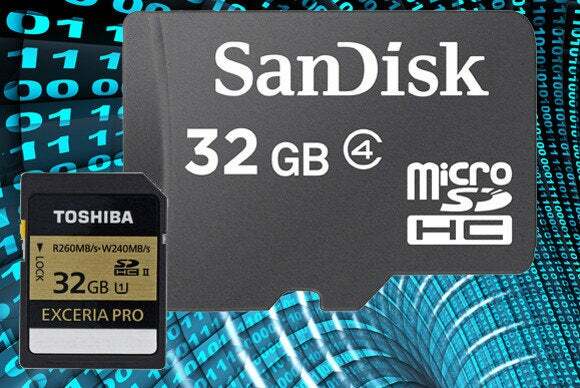 SD cards, the original form factor, measures 32x24mm. PCs often have full-sized SD Card slots. Mini SD cards measure only 21.5x20mm. These are now pretty much obsolete. Micro SD cards, which measure only 11x15mm, could be easily lost through a hole in your pocket. These little cards are very popular today, especially with Android devices. Mini and Micro SD cards often come with adapters that allow you to plug them into a full-size SD slot. Extended (or eXtended) Capacity (SDXC): 2TB maximum, although as I write this, you can't buy a card with a capacity over 128GB..
There’s another variant, SDIO (Input/output). These cards, which work only in very specific devices, offer more than simple storage. They can add GPS, Wi-Fi, and other features to your devices. SD Cards are also classified by speed, marked by a letter C (for Speed Class) with a number inside, which represents megabytes per second (MB/s). These speeds are often described by how well they can write a video stream. The lowest rating, C2, can manage only standard definition. The fastest, C10, can manage full HD with room to spare. Some high-end cards have a U instead of a C. These are Ultra High Speed (UHS) cards intended only for specific devices.